When you install RescueTime on your Windows machine at a point during the installation process, you will have the option to set RescueTime to start automatically whenever you turn on your computer. 1. Open the Windows Startup Folder. The easy way is to click Windows+R to open the “Run” box, type “shell: startup,” and then press Enter. 2. Create a shortcut to RescueTime inside the "Startup" folder. To disable the automatic start-up just open Task Manager by right-clicking on the Taskbar, You can also use the CTRL + SHIFT + ESC. Click “More Details,” open the Startup tab, and then click the Disable button. 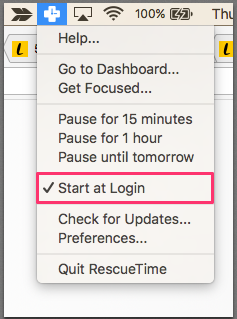 By default, when you install RescueTime, the application will be set to start at login automatically. But if you don't want to start the application every time you start your computer, and instead do it manually, you can change it. 1. Go to your RescueTime icon located on the menu bar. 2. From the drop-down, you'll notice that the Start at Login menu item is check. Just click on it to remove the checkmark.